Beyond just singing, this is a unique and complete journey to nurture and inspire You, Your Practice, and Your Musical Life. You’ll have a sublime experience. The more you become a regular participant, the more you enjoy the immersion and the divine creative community. If you are drawn to the intersection between artistic expression, nature, and spirituality, this is a program for You. 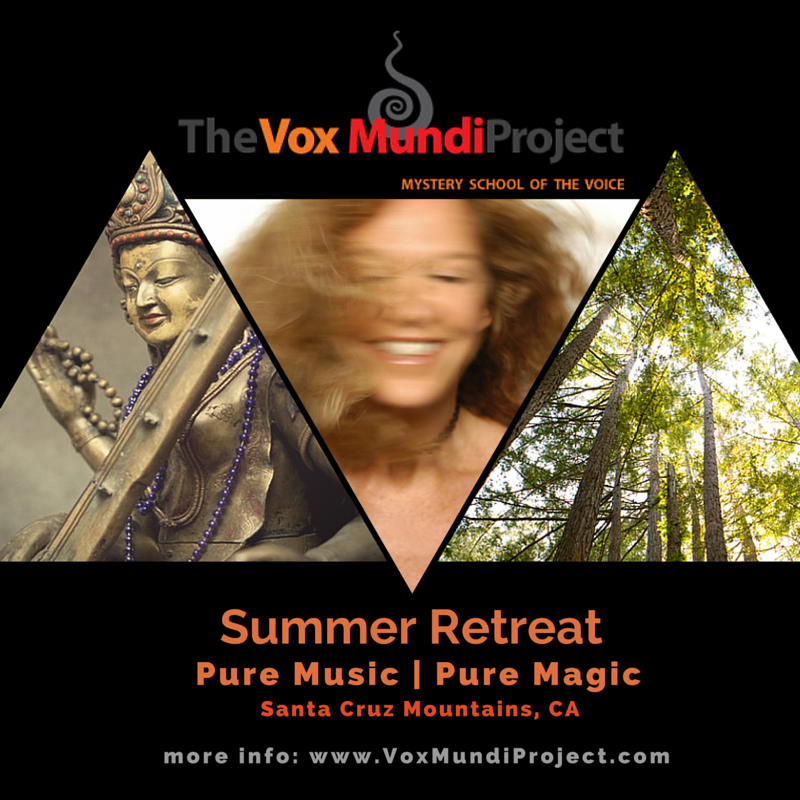 This retreat offers a delicate balance of musical awakening and creative support. You experience body-mind-spirit teachings, ecstatic chanting and dances, sound healing journeys, yoga of the voice and teacher’s training, and unique artistic collaborations. Surrounded by gorgeous 150 acres of sacred nature and divine architecture, and…Consider enjoyment! DEPARTURE: Retreats ends at 2:30PM on August 14 after breakfast. We recommend to get a flight after 3 PM to share rides to the airport. Most convenient and closest Airport: San Jose. Avoid San Francisco (SFO) for sure and Oakland Airport if possible. WHERE: This residential retreat takes place at the Pema Osel Ling Retreat Center, a pristine Buddhist sanctuary, Meditation and Magical Arts School in the Santa Cruz Mountains, CA. FEES: All-inclusive fees for the whole week starting at $1,300 for camping. Other fees will depend on type of lodging. Fees include all classes and special workshops with 10 master teachers and musicians, performances, individual tutoring, three healthy gourmet meals, lodging, use of facilities, and all applicable taxes. Weekend start any time on Friday and includes Sunday dinner and evening program. _ Friday from 8AM to Sunday at 11PM_ Weekend participants could also stay for the Monday morning session. The RETREAT CENTER has few TENTS available for RENTAL at $20 (one time fee for whole-week or weekend) doesn’t include mats and bedding. REGISTRATION: A of minimum $500 deposit is required in advanced. Balance must be paid/mail in full no later than July 15, 2019. Otherwise ONLY CASH AND CASHIERS CHECK ARE ACCEPTED ON SITE. There is NO CREDIT CARD FACILITY ON SITE. MAKE YOUR CASHIER CHECK PAYABLE TO SILVIA NAKKACH.